Lazortrone. First impressions. | Boom Beach. All about the Game! 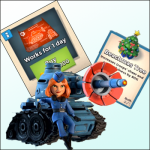 ← Winter update is coming (new unit Lazortron, decorations, Cryo bomd, etc.)! 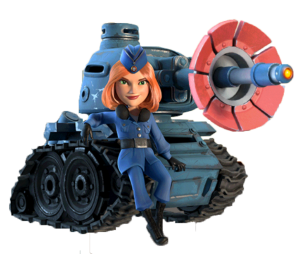 Lazortron is the first proto-troop in Boom Beach that was implemented into the Game with the last update! In simple words Lazortron is a laser tank (a mixture of tank and lazor beam prototype). 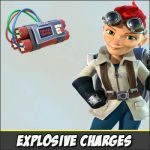 Like all units in the Game, Lazortron has own pros and cons… In this post I’ll like to share my impressions from the first days of using this new unit and some useful information. Since laser tank is a proto-troop, he’s not available in the Armory. Note: as for me, the absence of some kind of “proto-troops-armory-building” is a huge minus. If we have weapon lab for prototype defensive weapons, why don’t make the same kind of building for proto-troops? Now, it’s even not convenient to observe Lazortron characteristics (we can do it only using the landing crafts). 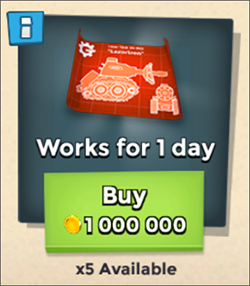 We can use laser tank only if we have special coupons (don’t know the correct name of the new currency), which we can buy from trader. 1 coupon for max lvl Lazortron costs 1 000 000 of gold and allow to use unit during 24 hours. But, in totaly, I think the idea with proto-troops is great! 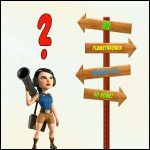 Keep going on in this direction, SuperCell! P.S. And lastly, a little poll. Please tell, what do you think about new proto-troop Lazortrone? What do You think about Lazortron? Super! 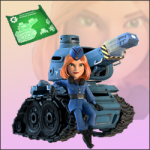 It's really cool troop! Overall good, but there are some flaws. Bad. Big energy consuming amd low health make this troop not interesting for me. Bad, because it's useless in TF operations.